Save up to 75%, why not try? 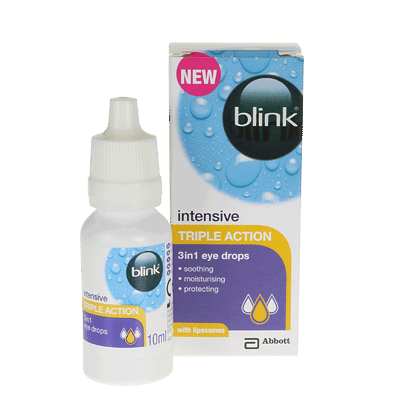 Blink Intensive Triple Action 3-in1 is a new and unique eye drop from the best-selling Blink range. Designed to soothe moisturise and protect, these eye drops are suitable for contact lens wearers and those who don’t wear contacts. The eye drops have a unique formula by AMO, containing sodium hyaluronate, an ingredient designed to offer fast and effective soothing relief from the symptoms of dry eye. The drops then add extra moisture to your eyes, ensuring your tear film is rehydrated. Blink Intensive Triple Action eye drops don’t just rehydrate your eyes, they also protect them from drying out as the day goes on. Containing liposomes, the drops work to reinforce the lipid layer of your eye’s tear film, preventing your eyes from losing moisture as the day goes on. Suitable to use whether you’re wearing your lenses or not, Blink Intensive Triple Action is an effective, easy-to-use solution to the issue of dry eyes. Browse FeelGoodContacts.ie now for more eye care products to maintain the health of your eyes.